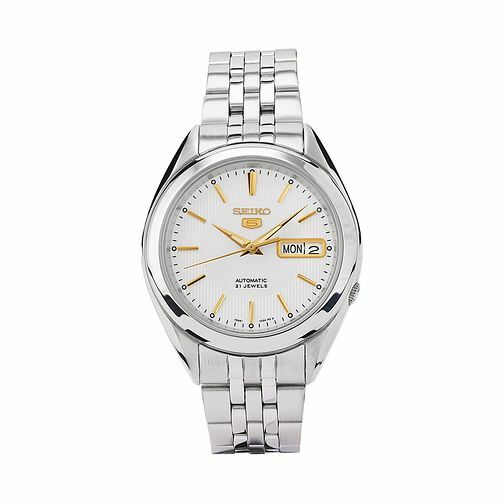 This sophisticated automatic movement edition men's watch boasts a round stainless steel case and a silver dial that reflects its modern design. The hardlex watch glass provides a strong protection for the dial and the gold tone/luminous hands and markers make for easy reading throughout the day and night. In addition to having a day and date function and with a water resistance of 30m, the watch is finished with a stainless steel bracelet that provides a comfortable and stylish finish. Rated 5 out of 5 by Anonymous from My first automatic watch Bought at 99 quid whilst on sale, this beautiful watch with some gold design really makes my day when wearing it. It encourages me to move my hands more, so it can be wound up. It gains less than a second a day, so I will correct the time once a week, a romantic relationship.